This is the first progress report of the team no 1 of the Nairobi INSPIRE Hackathon 2019. The team is led by Karel Charvat. The webinar of this team was organised on Monday 15th April 2019. The recording of the webinar can seen below. We started collecting answers on a few questions. The key questions are listed below. Why I would like work in this group? Food security is a major challenge in Kenya and Africa at large considering the country’s economy is largely agrarian. Any unforeseen changes in weather patterns could be fatal not only to our economy but also to millions of people who rely on agriculture for employment and as a source of livelihood. Food and nutrition security is my major areas of expertise therefore, I am always willing to participate in anything that can help to improve my knowledge in the area. Besides the major importance of food security in the development at a individual, micro and macro level, I believe that I will be more efficient in this team and I will participate significantly in the team. Food (and water) insecurity are a consistent drivers of vulnerability in Africa. I wish to be part of the solution to food insecurity problem by collaborating with other interested experts and stakeholders. Where Earth Observation can help to African Agriculture? Soil management can benefit a lot from earth observation. Modelling erosion would help avert loss in soil fertility. Near real-time crop monitoring data would be very helpful to farmers to enable them identify remedies to crop failures in good time and avoid losses. The same data could assist government plan in advance in terms of addressing the anticipated deficit in food stock hence avert cases of food shortage. Earth Observation will also be very important in prediction analysis in the agricultural sector. This will permit African Agriculture to be economical and technically efficient. It can also permit African countries to specialise in into different sector, therefore, develop trade agreement.. In highlighting the suitable areas for different agricultural practices and the hotspots of food insecurity. As any other thematic area, agriculture has a geographic dimension that can only be captured and revealed by accurate and dynamic earth observation data. Earth observation can be used to assess risks/threats to sensitive ecosystems like forests and wetlands. Forests and wetlands are known contributors to food security particularly when sustainably used. 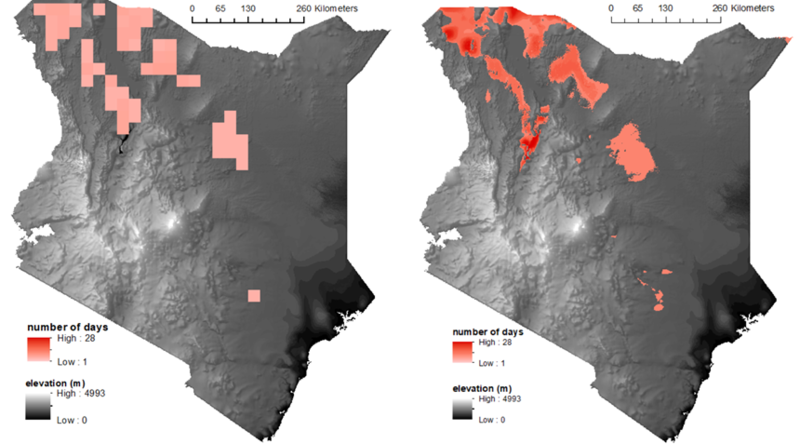 Sampling plots from different agro-climatic zones in Kenya and monitoring their growth using earth observation techniques together with ancillary data like weather data and biophysical data. Also establishing crop growth scenarios under different weather events could help in projecting future yields which is very critical in the planning operations and budgeting by state agencies and county governments. Prediction of disease susceptibility of crop using the temporal crop dynamics from earth observation data. Using historical data of crop disease and connecting them with features extracted from earth observation data for generating alert of probable crop disease. To make some experiments only based on observation data and compare the results. A combination of agent-based models of human activities and how these contribute to food (in)security and a dynamic changes in the environment as captured by big earth observation data. Accurate monitoring crop phenology to aid the application of farm inputs like fertilizers, irrigation and farm management. Assessment of hydrological flows through a combination of field observations and output from satellite image analysis workflows. Augmenting weather and climate monitoring through the use of affordable in-situ weather sensors and remote sensed weather estimates. Who are main target groups of farmers in your country? Do you have practical experience with implementation of EO in your country? I (Parmita Ghosh) do have for my country India and Germany (I was an exchange student in Technische Universität Darmstadt, Darmstadt, Germany). Can benefit small farmers from EO? Sentinel 1, 2 has spatial resolution of 20 m so small farmers can be benefited by the products developed using images from these satellites. Landsat can particularly be used for awareness creation on issues like land degradation and land use change and its influence on land health and the potential areas that can be used for farming. Other data will be downloaded on demand. There is expected also cooperation with team 3, 5 and 6. In cooperation with team 3 we will tested different OS software. See the candidate. For next communication will be organised Skype communication for the group. This is the first progress report of the team no 2 of the Nairobi INSPIRE Hackathon 2019. The team is led by Karel Jedlicka. There are in total 83 team members registered, 11 of them are actively collaborating and contributing. The active members are from: Czechia (3x), Switzerland (2x), Zimbabwe (1x), Uganda (1x), Nigeria (1x) and Kenya (3x). The team is currently working on a use case: a farmer uses meteorological data to plan maize planting and cultivation. The team has defined the concept, team assigned roles and answered open questions. The implementation will take part during the second half of April 2019. Climate data for maize cultivation – more granular GRID for temperatures? This is the first progress report of the team no 9 of the Nairobi INSPIRE Hackathon 2019. The team is led by Daniel Beran. We have acquired OSM data and preselected those layers that could be usable for traffic modelling. We are discussing setting of parameters in transforming OSM data into traffic generators. Prepare traffic network and traffic generators from OSM data. Moving prepared traffic data to STM developers. This is the first progress report of the team no 7 of the Nairobi INSPIRE Hackathon 2019. The team is led by Otakar Cerba. The goal of this team is to publish selected spatial open data from Kenya and other African countries as 5-star Linked Open Data (LOD). The datasets will be transformed and integrated into the Smart Points of Interest (SPOI) data model. The data model for the SPOI was designed during the SDI4Apps project and provides a universal exchange approach to publish point based data in RDF format according to the the linked open data (LOD) principles. Webinar (Friday 5 April, 10am) – during the webinar the Smart Points of Interest (SPOI) and initial statements of the team were introduced. Shared folder development – the folder contains presentations about SPOI in general, SPOI in Kenya, SPOI data model and Team 7 ideas; there are also shared documents to add new ideas or comments to Team 7 activity and new data resources for transformation to SPOI. The Team 7 has registered 29 participants (2 from Asia, 8 from Europe and 19 from Africa). Twelve participants were registered to the webinar, but only four participated actively. An overview of the countries represented in this team is shown below. This is the first progress report of the team no 8 of the Nairobi INSPIRE Hackathon 2019. The team is led by Uta Wehn. The recorded webinar of this team can be seen below.